When Andy Bracken and Keith Jones formed Fruits de Mer Records in 2008, their goal was to release music that should have been put out on seven-inch singles, but never was. It has taken six years and 50 releases to reach this goal. And to mark this FdM milestone, Keith was able to reach across the pond to Al Simones, the USA’s answer to Nick Saloman (aka The Bevis Frond), to select two of his favorite tracks from his back catalog for this limited-pressing (700 copies) colored vinyl 45 rpm single (two tracks from his 1998 LP Balloon Ride). Al grew up in northeast Ohio in the 60s and has produced four home-recorded LPs on his Purple Phrogg label over the course of 25 years. These LPs rapidly achieved cult status and in 2012 Headspin reissued them as a limited edition boxed set of 500 copies. Now, on September 22, 2014, Al Simones’ first ever 45 rpm single will be released. The A side contains the almost six minute “Majic Ship” and the B side is the five minute “Seize the Moment.” Both songs are acid-drenched trippy psych songs with lots of fuzzed guitar and distorted megaphone vocals. Al’s vocals have a faint UK accent, so you would never guess this music is from Ohio. And he gets adventurous on guitar from time to time, be it like Jimi Hendrix or echo guitars like Manuel Göttsching. For me I much prefer the B side, but this is more a matter of taste. 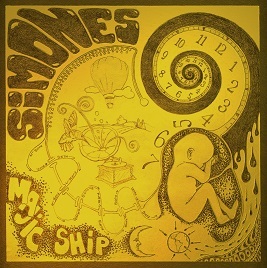 Now, thanks to FdM, it is possible to grab a slice of some obscure US psych.